I love my job. I get to be outside wandering through streams and navigating forests with some of the most incredible human beings,..children. I can not tell you how much I learn from my young friends in a simple blog post. I have learned patience, compassion, self efficacy, resilency, and the process of healing. For the last 7 months I have been working with a teacher and her class of brilliant and loving kindergarteners at Moretown Elementary School. I thought I was just inspiring teachers and their students to learn outdoors. Instead, I have been taught one the most powerful lessons of my teaching career. Please read the story below, written by Pam Dow of Moretown Elementary. Our school year started like none other. Just two days before our scheduled opening, parts of our village and town were ravished by tropical storm Irene. The opening of school had to be delayed. Children and families spent the first days after the flooding wrapping their heads around the magnitude of the disaster that destroyed their homes and town. Quickly it became neighbors helping neighbors, strangers helping strangers, Moretown helping Moretown. Although many of our material possessions were destroyed by the flooding, our sense of community was just beginning to emerge. Many children’s homes were flooded and their prized possessions were gone or covered in a thick, gooey muck that was left behind after the waters receded. The school suffered damage as well, and as staff went about helping families clean out their homes, a professional cleaning crew set to work on the school; ripping up all flooring, scrubbing and sanitizing anything salvageable that came into contact with the contaminated waters. Although crews worked hard for many days, our school building was still not safe for students. Many of our school children were experiencing the most tragic event of their lives, watching their homes and town be destroyed. They saw the sides of the main street piled with debris-residents’ belongings and the guts of their homes, not salvageable due to the wrath of Irene. Moretown children needed normalcy. They needed something they knew and loved, which was why the staff knew school must go on. 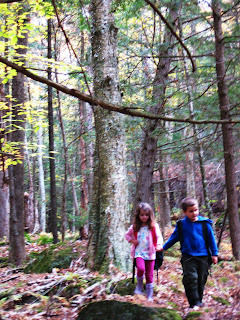 We began our school year with a series of fieldtrips to destinations across Vermont. Destinations that welcomed us with open arms and kindness. After several days of fieldtrips, we began school in tents set up on our baseball field. With surprising ease, children and adults adapted to our tent school. Teacher’s taught, children learned. I think we all grasped at this sense of normalcy, this idea of routine…school. We were together as a class, a school, and a community and for a few hours we could focus on something other than the destruction of our homes and town. When the time came to return to our classrooms, it was a celebration. Kindergartners were excited to begin a new program, a Nature Adventure Program, which connected students with the forest behind our school. For three hours each week, we have had the distinct pleasure of working with Amy Butler from the North Branch Nature Center. It quickly became apparent that this program was vital to the health and well being of our children. I have watched as children eagerly wait for Wednesday mornings to arrive so they can go out into the woods behind our school to explore, build, and connect with the natural world around them. The timing of this program was perfect; these children were living out the realities of a natural disaster but were able to escape into the woods for solace each week. This group of five and six year olds quickly took to building…building with sticks and stones, leaves and natural materials. They built and built, from small mouse houses to “sewers” (large holes at the base of trees) that they dug with sticks. The building continued all fall and winter and now into spring. The sticks and stones and their actions represent much more than children exploring in the woods. These children have been putting actions behind their emotions. They are mimicking the actions of the adults around them, they are rebuilding. As these children watched their town slowly being rebuilt, they, too, rebuilt their sense of normalcy, rebuilt their sense of safety, while rebuilding their homes in the woods. Five and six year old children love to build; building in the woods, however, took on a whole new meaning. This group of children used its time in the forest to heal, to make sense of the devastation that took over their lives. 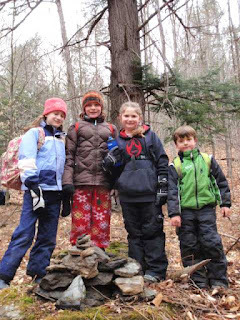 Through their experiences, these children are becoming leaders, eager to assist their friends up a steep hill or share their knowledge of the natural world with others. 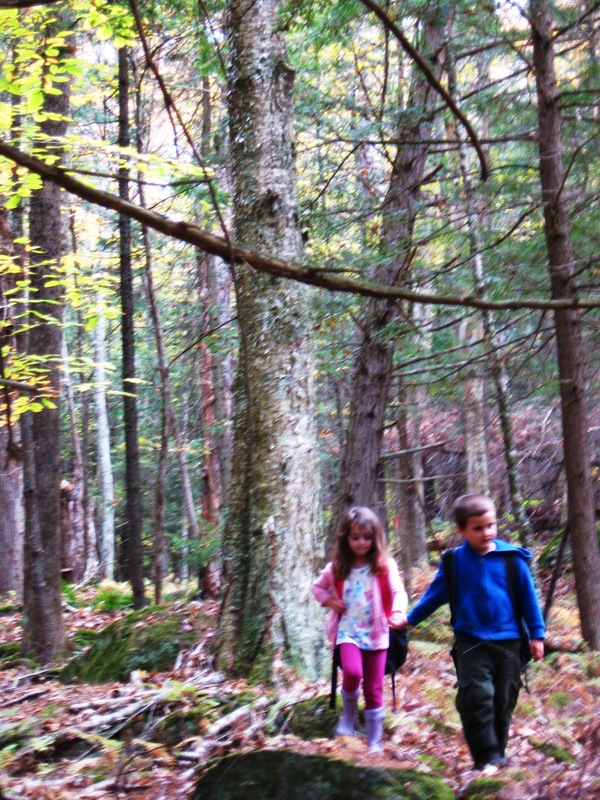 These children have been given the gift of the forest this year. It was just what they needed as they experienced the rebuilding of their town and so many lives. This year it was the flood. Next year, however, it could be Mom and Dad’s divorce, a car accident, the death of a loved one. I have come to realize that our natural world is a place for healing. Time spent outside is time spent learning about life, about our sense of community. Children need to be given this gift each and every school year. 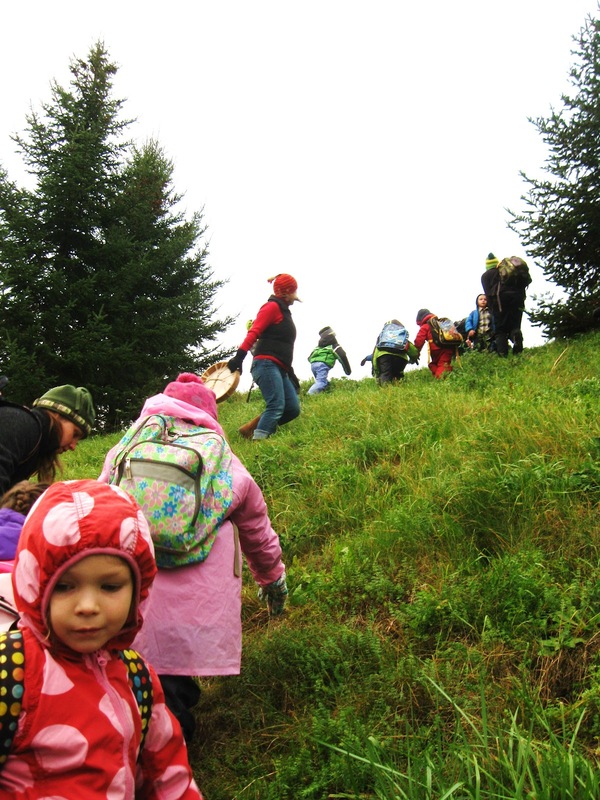 Want to learn about what students are doing in ECO or Forest Schools? Interested in NBNC's education posts?